INDIANAPOLIS, Ind., July 10, 2008 – In the interest of full disclosure, management is providing this quarterly report on the operational activities and overall production outlook for May Dreams Gardens (GSE-MDG). This report covers the time period from April 1, 2008 through June 30, 2008. In the area of mowing, as of the end of June 2008, the lawn had been mowed 23 times compared to 19 times at the end of June 2007. This represents a 17% increase in mowing over last year, resulting in an increase in overall fuel costs, caused not only by the increased mowing activity, but also by the increase in overall fuel costs in general. This increase in fuel costs was offset by a decrease in water usage, as rainfall has been plentiful this year, compared to 2007, when watering of the lawn began on May 31st, a record at May Dreams Gardens. Management noted that this year the record was for the most rain in June at May Dreams Gardens, thus the overall result is that the mowing, though frequent, has been enjoyed and is likely to continue at near this pace, setting a new record for number of times to mow in a given season. 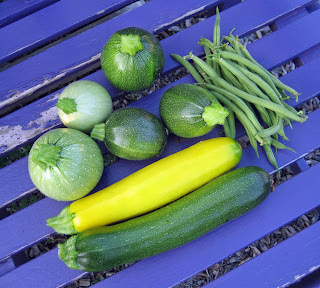 Production activities in the vegetable garden have provided mixed results. While the cool weather and abundant rain resulted in excellent spinach, pea, and lettuce production, it seems to have slowed down the warm season crops, beginning with a delay of approximately one week in planting out the garden, as compared to previous years. However, management remains optimistic that due to the abundant rain and now increasing temperatures, production levels in the garden will exceed those of the previous year when the problem was one of drought. Management would like to particularly note that the strawberry crop was the best in recent memory, and while much of the product was consumed within hours of harvest, some product was diverted into a manufacturing channel where it was made into Strawberry Freezer Jam. It is anticipated that this will improve the overall morale of staff later in the year, when this is consumed when no other fresh product is available. The overall political climate surrounding the garden remains steady. Management took appropriate measures to ensure a peaceful truce with the bunnies by using the latest technologies to deter the rabbits and keep them from interfering with future garden production. There were, however, some minor skirmishes involving the neighbor’s cat, resulting in the loss of one pepper plant. However, this was offset by the acquisition of three other pepper plants as a result of staff assisting her non-gardening sister in planting a container with one tomato and one pepper plant, the one pepper plant being available only in a 4-pack. This ‘waste’ of 3 pepper plants was diverted to May Dreams Gardens to be used to increase overall production. All applaud the fiscal conservatism in these efforts overall. In the area of expense and income, it was noted that the 2nd quarter is traditionally a time of high expense as raw materials in the form of seeds, soil, and plants are acquired, in anticipation of future production in the 3rd quarter. Therefore, high expense at this time should be overlooked and not be cause for concern. It is likely to be offset with product in the 3rd quarter, and such product, when consumed, will result in less income being used at the local grocery store. It was also noted that the flower color diversification program begun in late 2007 and continuing in the 2nd quarter is beginning to pay dividends as there does seem to be more mid-summer colors other the yellow. 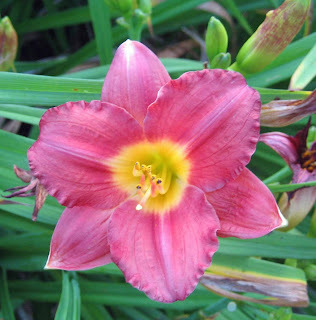 This should be borne out in the upcoming report to be filed for Garden Bloggers’ Bloom Day on July 15th. Additionally, it was noted that due to 100% improvement in spring weather in 2008 compared to 2007, overall spring flowers were outstanding, particularly the tulips, lilacs and peonies. Management and staff’s absence from the gardening at the beginning of the quarter in early April 2008 does not seem to have negatively impacted the garden, and has in fact infused them with new ideas that if implemented should continue to improve May Dreams Gardens. They are encouraged to continue to look for opportunities to learn more and bring this knowledge back to the garden, while at the same time completing the plant catalog of the garden and the gardener’s life list to provide focus, as time permits. Analysts believe there should be windows of opportunity (WOO) to complete these activities, plus planned garden expansion, while keeping up with overall production and mowing, given the generally good condition of the gardens at this mid-point of the season. How’s your garden doing so far this year? You are to be commended for rescuing those peppers and being gracious enough to offer them refuge. This is all in all a wonderful report indicating excellent gardening skill on the part of management. We look forward to similar achievements in the coming quarter. Is there going to be an IPO? Can I invest? What a glowing report, the management should give the staff a bonus for such an improvement over 2007. Some others may consider increased mowing a negative however. Overall, the food production looks extremely impressive, as well as the color increases. 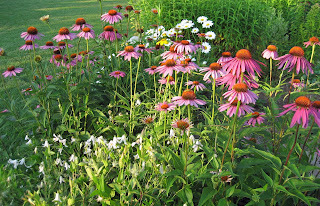 What would we do without those coneflowers? Looks like this will be MDGs most successful year to date! Careful observation, rigorous reporting, and a cupful of humor--that's what sets MDG apart! I agree with Frances--sounds like the staff and management at MDG deserve a bonus. Could that be why they took the truck this morning with thoughts of maybe stopping by a garden center? All in all, an excellent report, and the management is to be commended. However, the absence of a report on MDG's enrollment and hearty participation in Plurk is a glaring omission and should be addressed by the Managing Director of May Dreams Gardens (MDMDG). This omission is especially notable in light of the many, varied and worthwhile contributions by MDG garden consultants such as Bumblebee Gardens, Red Dirt Ramblings, Mr. McGregor's Daughter, Growing A Garden in Davis and myself. We look forward to your rectification of this omission. I agree, you are brilliant! Management should be most pleased. I'd invest! The report from Squirrelhaven is more mixed than MDG due to the end of April surprise freeze. However, mosquito production is way up & shows no sign of a slump. Your Blog is a "hoot" AS well as being very informative.. I am a new reader, and have yet to plumb the depths of the contents of all the writings, twitterings, reports from Management , etc . to be found around here.. Happy gardening from Upstate New York..! and thanks again.!! May Dreams Gardens has set an exemplary standard for all management. I suggest the CEO run for political office--government could learn a few things from this business. Greenbow management is delighted to read the report from May Dreams Garden. Here the WOO's are open and all are growing well. Normally, without an on-site audit, I would hesitate to give an opinion statement. But, relying on management's numbers and down to earth photos, I say MDG deserves a clean (hey, wait, let me see your hands) opinion. Thanks for those photos and all the info, MDG.